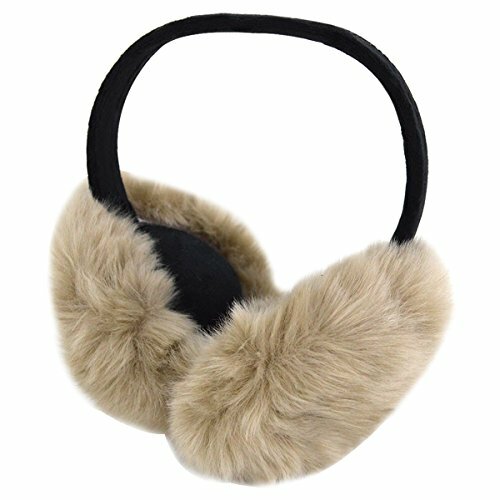 Editha Men Women Faux Fur Earmuff Winter Warm Earcap Foldable Ear Muffs Sport Gym Earmuffs Outdoor Travel Earcaps 1791 Khaki | What Should I Say? Made of high quality faux fur; adopting the soft and smooth texture, superior comfortable to wear and to touch, perfect keep warm, seam sealed to keep moisture and wind out. Solid pattern looks so fashionable and stylish, dresses up you attractive and full of personality charm in winter. Easy to carry, it can flatten small enough to fit in your pocket nicely when not wearing, thanks to patent foldable design. Great gifts for men and women. Perfect accessory for winter¡¯s outdoor activities: biking, ice skating, hiking, skiing, or simply walking the dog. Product size: 6.3 * 4.3 * 7.5in. Package include: 1 pair of earmuffs. Please allow 1in difference due to manual measurement and slight color variation due to different display setting. Washing note: Hand-wash and machine washable are both OK. Do not bleach, just naturally dry or tumble dry low. Please kindly let us know via Email if you got any problems, we will try our best to meet your requirement! Product size: 6.3 * 4.3 * 7.5in. Adjustable frame allow the ear warmer to comfortably fit a wide variety of head sizes. If you have any questions about this product by Editha, contact us by completing and submitting the form below. If you are looking for a specif part number, please include it with your message.